Save your scenario often! 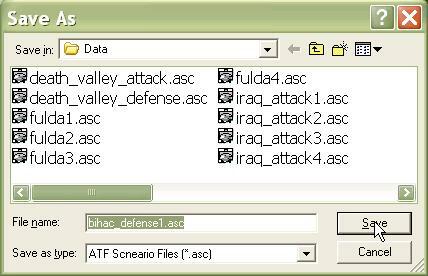 Even with all of the great tools available in the ATF Scenario Builder, it still takes some work to create a scenario. And nothing is worse than having to redo work because you forgot to save it. The 'Save' function allows you to stop working to continue later in a new session. After you have saved your scenario, it is safe to close the ATF Scenario Builder (if you forget to save, the editor will prompt you to save before you exit). To continue working on your scenario later, just start up the Scenario Builder again and select 'Open an Existing Scenario' from the opeing dialog. Saving a scenario is no different than in any other Windows application. What you can't see is that the scenario editor is also saving each component file in the scenario, to ensure changes are not lost. 1. Select 'Save', either from the toolbar or the 'File' menu. 2. The first time you save the scenario, the editor will ask you to confirm the file title of the scenario you are saving. We do not recommend changing this name. Changing this name will not change the name of all of the subordinate files in the scenario, and will make the individual files in the scenario harder to find.